Typed letter signed, one page, 6 x 8.25, personal letterhead, December 27, 1977. Brief letter to Susan McCain at WXIA-TV in Atlanta, typed by Wayne’s last secretary(and lover) Pat Stacy and authentically signed by John Wayne. In full: “Mission accomplished. Thank you for the compliment.” Accompanied by the original mailing envelope; and a silver Zippo lighter, engraved on one side, “The Shootist,” and “Stolen from John Wayne,” on the other side. 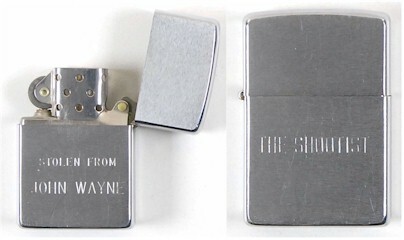 Wayne had a habit of providing these lighters to colleagues and friends on the sets of many of his motion pictures. When McCain was employed by Wayne, a lighter of hers was taken and never returned. She wrote to Wayne and received the lighter and letter offered here. In fine condition..